Long before Toshiba had the "Hello Tosh, Got a Toshiba?" 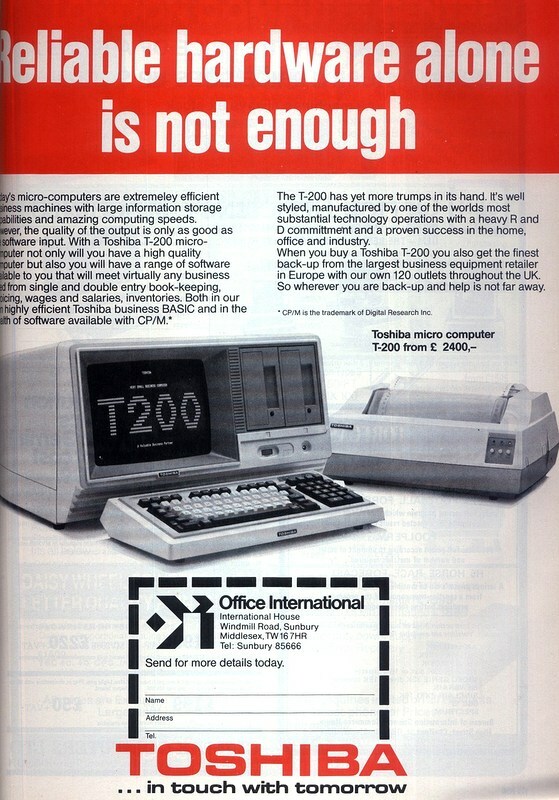 line with its laptops and a couple of years before it joined the Microsoft-backed MSX attempt to set a new standard in hardware comes this advert for the T-200, a moniker which predates the naming scheme for cyborgs in the Terminator franchise by a couple of years. The T-200 was an Intel 8050-based machine running CP/M, which copied its 32K ROM-based "Toshiba Business BASIC" in to RAM at start-up to improve performance, leaving 32K for the user. It had an 80x24 screen, 560K of disk in the form of two double-sided double-density drives and came with an 80-character 125 cps dot-matrix printer. It was launched in the UK by re-seller Office International at the International Business Show on the 20th October 1981 and initially retailed for £2,995 (£12,200 in 2019), which compared well against other similar-specced machines such as the Intertec SuperBrain. Although it looks a little like a luggable such as 1978's IMSAI PCS-80/30 or the more contemporary Osborne 1 from 1982, it was bigger than it looks in the advert and weighed in at somewhere between 15kg and 30kg, which made it a hefty blob of hardware. Apparently the coming of the all-conquering IBM PC rendered this machine, and many others, obsolete, although Toshiba did try again with its MSX computer a couple of years later, before really finding its feet as a laptop manufacturer in the 1990s.